Written by gamer one on October 30th, 2015 February 14th, 2017 . Background: Harebrained Schemes has launched its latest kickstarter, a brand new Battletech computer game from original Battletech tabletop creator Jordan Weisman and MechCommander producer Mitch Gitelman. Mike McCain, the creative director of Harebrained Schemes’ recently successful revival of Shadowrun, is also involved. Harebrained Schemes is a relatively new company composed of veterans from the tabletop and computer games industries. They have launched a successful digitally enhanced tabletop game, Golem Arcana, and three Shadowrun computer games. All of the previous games have been generally well received – with the first Shadowrun game being the weakest – so, the chops to make a new Battletech game are there. Battletech is a long running tabletop/roleplaying/computer game/novel series that has had its ups and downs during its thirty year history. Battletech is set in the 31st Century where mankind has explored the stars, found them empty, and does what it does best, warfare. Specifically, combat between giant humanoid metal machines called BattleMechs (Mechs). Due to the large distances of space, humanity adopted a feudal system of governance full of intrigue, politics, and most importantly, war, lots of war viagra billig. 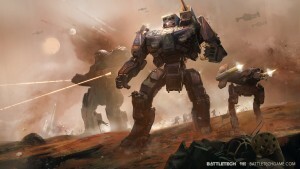 A nice primer of the universe can be found here: http://bg.battletech.com/new-to-the-board-game/ . The game is designed to be a turned based tactical game where you run a mercenary company who contracts with the various political entities known as the Great Houses. As the leader of your mercenary company, you recruit pilots and acquire new Mechs by buying them, stealing them, or salvaging them off the battlefield. The game will feature a single player story and an expanded mercenary campaign. There will be combine arms, a fancy portrait system, and, if the stretch goal is met, a player vs player multiplayer mode based on the gladiator planet Solaris VII. The game utilizes art assets from the ongoing multiplayer battle area game MechWarrior Online. http://mwomercs.com/. Also, of note, epub novellas are going to be written for the game by famed Battletech writer Michael Stackpole, who finished doing something similar for Wasteland 2. http://www.michaelastackpole.com/. All and all everything looks promising so far and the release date is set for May 2017. I agree, that is a ways away but the treatment is intriguing. Reasons to be excited: Harebrained Schemes has a solid track record so far of releasing solid projects, nothing that is an “A,” but have reached solid “B’s.” Battletech is a concrete franchise with a lot of potential for great stories and fun games. The mock-ups have looked good and the fluffy parts of the games – like art, story, interface, etc. – should be very good. Harebrained has showed that they get what makes turn based combat fun. All the elements are there for a good game and the ability to execute. Nothing about the backer tiers seems exploitive, and Harebrained has a great track record with completing their Kickstarters in a timely manner. Honestly, the tiers on this Kickstarter are what we want to see, each tier is basically choose your own collector’s edition. MechCommander was a very fun game and if this can incorporate any of those elements, then this game should be a blast. Reasons to be concerned: This game is bigger and larger in scope than anything Harebrained has attempted in the past. That isn’t necessarily a reason not to back but it is something to consider. It is easy to see how this game will not deliver the complete Battletech experience it promises. For example, a near endless Mercenary Campaign seems hard to implement because elements of randomness feel dicey in such games. I can see how it could be fun, but I can also see how it can be tedious and ultimately, dull. Battletech’s previous games have been a pretty mix bag with some games being great (MechWarrior 2 and 4), and other below average (MechAssault). The other problem with having a story mode in a game like this is that Battletech is a fixed story, nothing you do will cause the Kurita, Davion, or Steiner Houses to collapse. The stakes have to be localized to your character which worked great in Harebrained’s Shadowrun: Dragonfall but in Shadowrun: Hong Kong it just missed the mark. Also, since this is set in 3025, there will be the no Clans (although I would wager there will be a Clan Easter Egg in a mission) which may turn off some Battletech fans. Further, waiting until May 2017 is a long wait. It is hard to criticize Harebrained for having a realistic timeline, but it is still a long wait and a lot can happen. Additionally, while Unity has led to a lot of good games, as an engine it seems like this game will push it to its limits. Nothing is worse than fighting your engine to make a good game. Further, multiplayer seems like it will eventually be added to this game, even if it is a separate Kickstarter down the road. These concerns are basically true of all new games, but seem more likely in this case. That being said, I am still extremely optimistic overall. Overall Thought: I honestly think that when all is said and done, this game will be a solid “B” and, if you are a fan of Battletech, then this might even be an “A-.“ I do think being a fan of Battletech is a must (full disclosure, I totally geeked out and tweeted out #mybtstuff and #BTmemory for Harebrained Schemes’ four week advertising Backer Missions). Ultimately, I think the $25-$50 dollar tiers have decent value, if you are inclined to back a computer game.